Lately there has been an increase in customer interest regarding our hydration supplementation products. We are happy to help! Hydration is such a key ingredient to keeping your body at a happy and healthy state. Being effectively hydrated cannot be done with just water alone. A drop in as little as 2-3% in body weight can really decrease an athlete’s performance. In fact there are very few instances that just drinking water alone can help you maintain a normal blood plasma polarity. This condition is created by not having a proper sodium to water ratio. This can be created when athletes just drink water which dilutes our body sodium concentration. In fact, people actually can die from this condition as it can pull the remaining water you have from your healthy cells into your blood plasma which can create unnecessary swelling (especially if it’s in your brain). A good rule of thumb is to bring 2 water bottles with you. One that contains a hydration mix and the other just plain water. 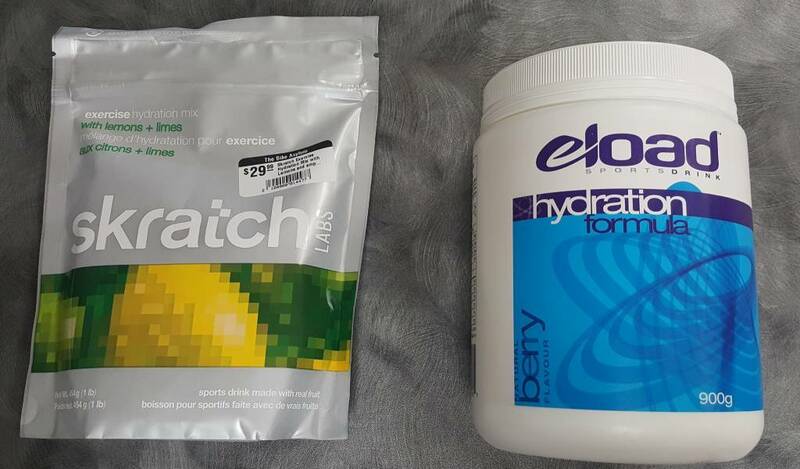 The hydration mixes that we carry are eLoad and Skratch. These 2 mixes contain primarily sodium, potassium, magnesium and carbohydrates. Not one is better than the other it is just what is better for you! Where eLoad may be better for someone who needs more carbohydrates, the Skratch has Vitamin C and more magnesium. Sodium/Potassium: is a necessary transport system that helps to move water into your blood cells. Crucial in proper hydration. Magnesium: a huge help in cramping muscles and is so positive in cell health. When the body is stressed (even a healthy stress) it uses magnesium, so replenishing it is important. It is commonly recommend when athletes have Restless Leg Syndrome. Carbohydrates: aka sugar. So important in preventing athletes from “hitting the wall” or “bonking”. Some bodies use more or less. You want to make sure that you are keeping a level blood sugar level. This can be hard for some people when you wake up for our Saturday morning ride and the last thing you had to eat was your supper at 8pm. Your blood sugar is low which can create fainting, nausea, headaches and confusion. So on your next ride equip yourself with an electrolyte complex that will help you keep you at your optimal performance standards as well as a healthy body state.